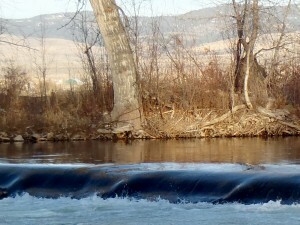 This irrigation dam on the Bitterroot River is the focus of a decision to close this stretch during periods of high water. Montana Fly Fishing Magazine file photo. According to a recent Billings Gazette article, the state Fish and Wildlife Commission gave the go-ahead for officials to place temporary closures on the Bitterroot River between Woodside Crossing and Tucker Crossing when they find the river conditions below an irrigation dam along that stretch to be too dangerous. Although the proposal to pass this measure was unopposed, the closure does have it opponents. Some believe it to be an unnecessary hindrance to advanced boaters who know how to navigate such obstacles, and that fallen trees in the river are equally if not more dangerous. Still, regardless of your stance, it is important to be aware of these potential closures if they might affect your plans to float the Bitterroot this summer. In addition to posting signage about hazards associated with the irrigation dam, it sounds like FWP plans to have personnel on site at Woodside to inform floaters when a closure is in effect. For more information on this closure, and the controversy surrounding it, visit the Billings Gazette article here.